I kind of feel like summoning Sam I Am, just to tell him I do like deviled eggs. If you had asked me a week ago I would have said absolutely not, no way, no how do I like deviled eggs. Not in a boat, not on a train… you get the picture. The eggs The Kiddo dyed watched The Yankee and me dye for Easter were super-yummy farm fresh eggs given to us by a friend of The Yankee. And it sure seemed a waste to just chuck them, especially since I’d tried a new boiling method for them while under tornado warning — setting timers and hiding in coat closets at the same time. Multi-tasking, no? So I figured I just HAD to try them. And whaddaya know? Pretty stinking good! After 17 minutes, transfer the eggs to a bowl of ice water with plenty of ice cubes in it. After eggs are properly chilled, let your two year old thwack the eggs into a basket with absolutely no regard for gentleness or fragility. Repeat three times for most thorough cracking of eggs. Now make deviled eggs! I based mine on Joelen‘s yummy method. Pretty yummy, right? The farm eggs had a fantastic yellow color that made these just gorgeous. And SO GOOD to eat! Who knew? 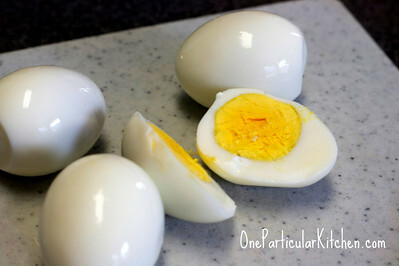 That’s how I hardboil eggs too! I love deviled eggs. They’re one of my favorite sides. I *loved* these — and I was so surprised by that! 🙂 Do you think it’s worth the extra steps of boiling-cooling-boiling-cooling? 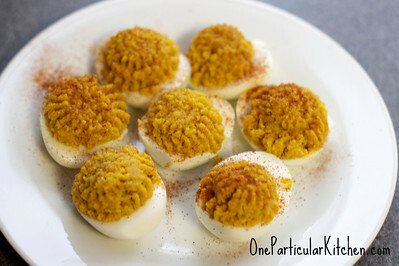 I love Deviled Eggs, especially when my mom makes them. I’ve never made them with croutons…. hmmm? I think I might subscribe to your theory and give yours a try! Mom makes hers with mayo, salt, pepper, mustard, splash of vin. or the juice in the pickle jar and a pinch of sugar. Girl, I’m with you on the pickles…. I can’t stand them! It’s supposed to prevent them from turning that greenish color so I guess it’s worth it if you can standing waiting! Yummm! I love deviled eggs. I can eat them anytime of day or night. I boil mine the same way but 13 minutes off the heat. I just run cold water into the pan afterwards, then plop in the refrigerator. Sometimes, I’ll add a little horseradish to the yolk mixture. Hmm, I just might have to make some soon.